'Baroda Gift Card' is easy to carry and convenient to use at merchant outlets to purchase items of choice. 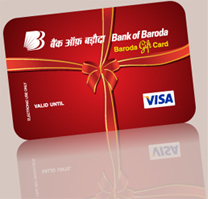 The Baroda Gift card is backed by VISA and is usable at any of its network of shops in India. The Gift card gives you flexibility of multiple use any time and any location of your preference. The card can be retained as a memento for its attractive look and design after its usage. A perfect substitute for cash and provide opportunity to recipient of the Card to purchase products of their choice. Card valid for One year from the date of purchase or the date printed on the card whichever is earlier. ATM Cash withdrawal is NOT permitted. Give your loved one something they would love with the Baroda Gift Card. An unutilized available amount of Rs.100/-(Rupees One hundred only) and above at the time of expiry of the validity period, has to be revalidated with a new gift card. Revalidation will be done only on the request of purchaser but not beneficiary after deducting bank charges ,provided such a claim is made with the bank not later than 3(three) month from the expiry of the card.